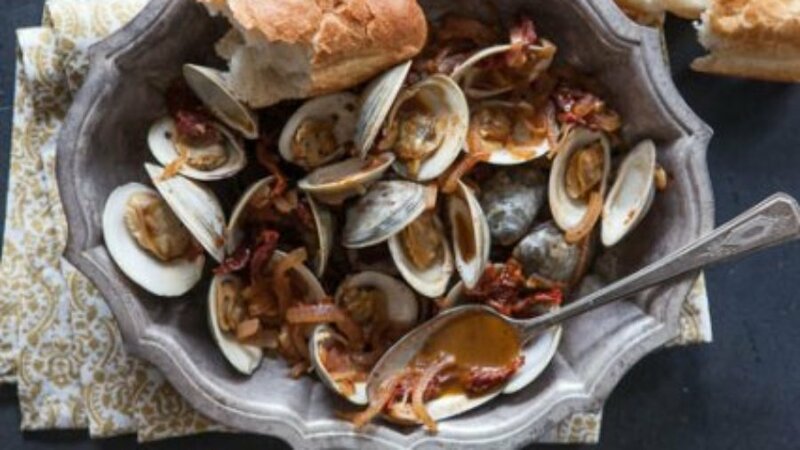 This easy clam dish packed with onions, garlic and tomatoes smells as heavenly as it tastes. Serve with crusty bread or over whole grain pasta to sop up all the wonderful juices. Heat oil in a large, deep cast-iron skillet or other large skillet over medium-high heat. Add onion and cook, stirring frequently, until soft and lightly browned, about 10 minutes. Stir in garlic, chile flakes and salt and cook for 1 minute more. Stir in tomatoes and wine and boil for 2 minutes. Add clams, cover and cook, shaking pan frequently, until clams open, 5 to 10 minutes. (Discard any clams that do not open.) Sprinkle with parsley and spoon into bowls.